Burnaby is the city immediately east of Vancouver. It is the third-largest city in BC by population (estimated population of 197,292), surpassed only by Surrey and Vancouver itself. In 1992, Burnaby celebrated its 100th anniversary and officially changed from the Corporation of the District of Burnaby to the City of Burnaby. Burnaby occupies 98.60 square kilometers (38.07 square miles) and is located at the geographical centre of the Greater Vancouver Regional District. Situated between the City of Vancouver on the west and Port Moody, Coquitlam and New Westminster on the east, the City is further bounded by Burrard Inlet and the Fraser River on the North and South respectively. Burnaby, Vancouver and New Westminster collectively occupy the major portion of the Burrard Peninsula. The elevation of Burnaby ranges from sea level to a maximum of 1,200 feet atop Burnaby Mountain. 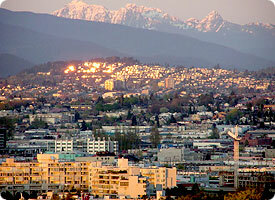 Overall, the physical landscape of Burnaby is one of hills, ridges, valleys and an alluvial plain. The land features and their relative locations have had an influence on the location, type and form of development in the City. This diverse and exciting regional town centre encompasses a complete range of shopping, accommodation and recreation facilities. Within Metrotown you can enjoy Central Park, with its nature trails, picnic and golf facilities and professional sports at Swangard Stadium. You can also experience the largest shopping and entertainment complex in the province, the beautiful Burnaby Library and Civic Square and the Bonsor Recreation Complex. All of this is within walking distance from one another and is readily accessible from Vancouver, New Westminster and Surrey via SkyTrain. Simon Fraser University has three campuses: Its main campus in Burnaby, a satellite campus in Vancouver's Downtown at Harbour Centre, and the new SFU Surrey campus. It is also a partner institution of the Great Northern Way Campus in Vancouver.